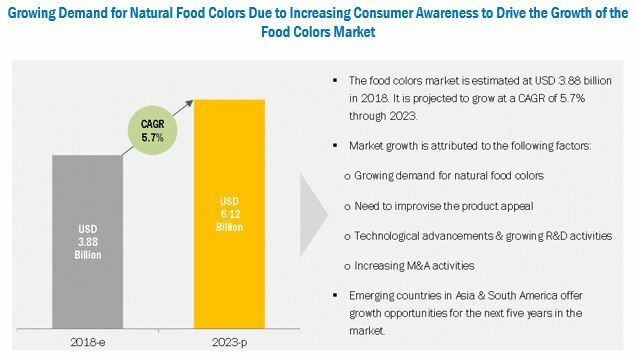 [206 Pages Report] The food colors market was valued at USD 3.71 billion in 2017; it is projected to grow at a CAGR of 5.7%, to reach USD 5.12 billion by 2023. 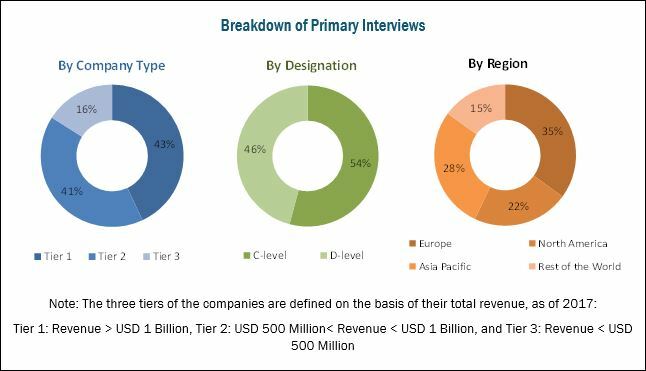 The basic objective of the report is to define, segment, and project the global market size for food colors on the basis of application, type, form, solubility, and region. Other objectives include analyzing the opportunities in the market for stakeholders and providing a competitive landscape of market trends, analyzing the macro and microeconomic indicators of this market to provide factor analysis, and to project the growth rate of the food colors market. The base year considered for the study is 2017 while the forecast period considered is from 2018 to 2023. This report includes estimations of the market size in terms of value (USD million). Both, top-down and bottom-up approaches have been used to estimate and validate the size of the global food colors market and to estimate the size of various other dependent submarkets. The key players in the market have been identified through secondary research (from sources such as press releases, paid databases such as Factiva and Bloomberg), annual reports, and financial journals; their market shares in respective regions have also been determined through primary and secondary research. All percentage shares, splits, and breakdowns have been determined using secondary sources and were verified through primary sources. The figure below shows the breakdown of profiles of industry experts that participated in the primary discussions. The key players that are profiled in the report include ADM (US), DowDuPont (US), Sensient Technologies (US), Kalsec (US), DDW (US), Chr. Hansen (Denmark), DSM (Netherlands), Naturex (France), Döhler Group (Germany), Fiorio Colori (Italy), LycoRed (Israel), and Frutarom (Israel). The demand for natural food colors over synthetic food colors is increasing due to growing consumer awareness for clean label products, health hazards associated with synthetic colors, and the health benefits achieved by using natural food colors. Synthetic colors can cause allergic disorders among consumers. The use of chemicals with heavy metals such as lead or arsenic to manufacture synthetic food colors can cause life-threatening diseases. Natural food colors are gaining market attention due to their natural origin appealing to consumers who view them as a “safe to use” product. Natural colors reduce the risk of allergies and intolerance among consumers. Such factors are increasing demand for natural colors in food & beverage applications. The demand for food with a natural and clean label is increasing across the world, owing to increasing health awareness, increasing spending power of consumers, and increasing food adulteration instances. Food safety concerns caused by the chemical contamination of food and ill-effects of synthetic additives have resulted in an increasing number of consumers demanding clean label products. This rising demand has led to the launch of several new products bearing claims such as “natural.” As a result, food manufacturers are investing in clean labels, thereby leading to the introduction of new products or revision of existing product portfolios by incorporating clean label food colors. In 2007, a UK government-funded study concluded that the consumption of artificial colors results in hyperactivity in 3-year-old and 8/9-year-old children. The Food and Drug Administration (FDA) found that synthetic colors (Blue 1, Blue 2, Green 3, Red 40, Yellow 5, and Yellow 6) show signs of causing cancer in lab animals. Artificial colors such as yellow 5, yellow 6, and red 40 have been found to contain carcinogens. Caffeine is widely used as a colorant in soft drinks, which may cause heart palpitations and heart defects. Such adverse effects caused by synthetic food colors on the health of consumers are posing as a restraint for the growth of the food colors market. Stringent regulations imposed by the federal bodies of various countries have restrained the usage of synthetic colorants in food & beverage products. In the US, the FDA is the key regulating body for food additives. It regulates the inclusion of synthetic colors in food & beverages. Such regulations have restricted the use and demand for food colors. For instance, in 2008, a ruling was passed to ban food coloring in the UK. The six colors banned are E110, E104, E122, E129, E103, and E124. This has tremendously affected the consumption of food coloring in the food industry in the UK and its neighboring countries. Others (black PN, chocolate brown, and blue IV. 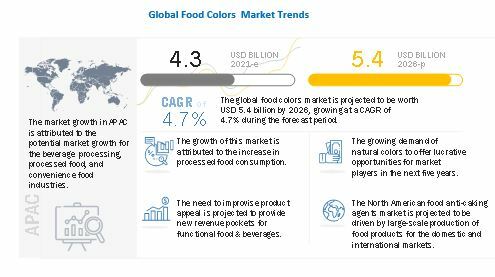 The global food colors market is estimated at USD 3.88 billion in 2018 and is projected to grow at a CAGR of 5.7%, to reach USD 5.12 billion by 2023. Factors such as the growing demand for natural food colors have significantly fueled the market for food colors due to the increasing consumer awareness for clean-label products and additional health benefits of certain natural food colors. On the basis of type, the carmine color accounted for the largest share, followed by caramel, in 2018. Due to their wide application areas such as cake icings, hard candy, bakery products, ice cream, yogurt, gelatin desserts, fruit syrups, and jam/preserves in the food industry, caramels are largely used by food & beverage manufacturers. Recent trends in the food industry see consumers leaning toward natural colors because of the health benefits associated with them. The food colors market, on the basis of application, is segmented into the food and beverages segments. Processed food accounted for the largest share in 2018, followed by bakery & confectionery products. Processed foods such as crisps, sausage rolls, tinned vegetables, savory snacks, and other convenience foods held the largest share of the food colors market. On the basis of form, the liquid segment accounted for the largest share in 2018. Liquid dyes are the most conventional forms applied in almost all varieties of foods. Their applications include tinting icings, batters, and doughs. On the basis of solubility, dye accounted for the largest share in 2018. Some examples of natural dyes that are used as food colors are carotenoids, chlorophyll, anthocyanin, and turmeric. These dyes contain nutritional values such as antioxidants, vitamins, and impart other health benefits; thus, there is a high demand for these kinds of dyes in the food industry. Europe accounted for the largest share of the food colors market in 2018. This market is driven by increased awareness about safe food color products among consumers, and inclination toward the health benefits provided by natural food colors. Asia Pacific is projected to be the fastest-growing market between 2018 and 2023. Emerging economies such as China and India play an important role in supplying food colors, either as raw materials or in processed forms, to the European market. The major restraining factor for the food colors market is the health problem caused by consuming some synthetic colors. Another factor could be the stability of natural colors, which changes with changes in atmospheric or processing conditions such as pH, temperature, and light. Some natural colors start decolorizing after some time of processing. Some natural colors can impart off-tones to the final product during processing. Companies such as ADM (US), Sensient Technologies (US), Chr. Hansen (Denmark), DowDuPont (US), and DSM (Netherlands) have acquired leading market positions through their broad product portfolio, along with a focus on diverse end-user segments. They are also focused on innovations and are geographically diversified. With the growing health consciousness among consumers, the demand for synthetic food coloring is declining. As a result of the adverse effects that these colors cause to human health, food manufacturers are constantly on the lookout for innovative ways to extract colors from alternative natural sources. Untapped raw material sources such as cabbage and algae beta-carotene that are compliant with the regulatory mandates offer opportunities for the growth of the food colors market. Intercropping of existing crops with coloring crops offers high growth opportunities for market by offering new sources of food colors. Food color manufacturers have tremendous opportunities for growth in the Asia Pacific and South American regions. Localizing operations can help in reducing costs and improving access to local distribution networks, thereby optimizing profit margins. Resources and labor are readily available at a cheaper rate in these regions. The governments in China and India are providing incentives for multinationals to set up Greenfield ventures. The Indian government has declared major tax breaks to attract multinational investors. China provides special tax incentives over the usual tax holidays to encourage foreign investors. India, China, and Brazil are focusing more on the biotechnological development and its application in the manufacturing of natural coloring ingredients. Food & beverage manufacturers are witnessing tremendous demand from these countries due to the increased spending power of consumers on healthy food and changed eating habits & preferences. All these factors are offering opportunities for food colors in the emerging economies of Asia Pacific and South America. Coloring foods are products such as fruits and vegetables that are used instead of food colors in food & beverage processing to impart color to the final product. The demand for coloring food such as tomato, beetroot, and carrot is rising as an alternative to other natural colors. Some regulatory bodies including EU legislation mandate the labeling of E number for natural colors. Consumers associate E numbers with additives in food. Due to this, the manufacturers and consumers are opting for coloring food to substitute natural colorants to avoid the need for labeling mandates. This creates a challenge for the growth of the natural food colors market. The FDA has categorized titanium dioxide as a safe to use colorant for food applications. Food-grade titanium dioxide within maximum permissible limits is safe, and no health risks have been observed pertaining to it. Consumers perceive titanium dioxide as a chemical which can cause life-threatening diseases such as cancer. However, there are no adequately evident studies available to prove this. However, misperceptions about the health hazards of titanium dioxide are creating a challenge for market growth. Sensient Technologies launched three new food colors—organic black carrot, organic annatto, and organic beet. With this launch, the company extended its organic food color portfolio. WILD Flavors and Specialty Ingredients, which is a business division of ADM, extended its natural food color portfolio by adding food colors based on extracts from pumpkin and a special carrot variety containing lycopene. ADM established an innovation center in Singapore to support R&D activities in the Asia Pacific region. Naturex expanded its geographic reach by appointing Chimab (Italy) as its distributor in the Italian market. Chr. Hansen expanded its natural food colors division to North America by acquiring a manufacturing facility of Banker Wire (US). Sensient Technologies acquired GlobeNatural (Peru). The acquired company is named as Sensient Natural Colors Peru S.A.C. (Peru).